Pastor Melton comes to us from New York where he has been serving as interim pastor at the New Hartford Presbyterian Church. He was born in Indianapolis, Indiana, and has served churches in Indiana, Kentucky, Pennsylvania, West Virginia, Ohio and New York. He graduated from Louisville Theological Seminary in 1985, the year of his ordination, and holds a Doctor of Ministry Degree from Pittsburgh Theological Seminary. 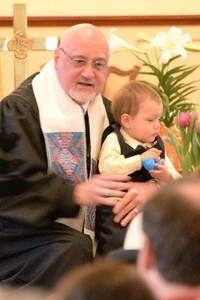 He has been a Presbytery Stated Clerk and an Interim Executive Presbyter. Throughout his career, Pastor Melton has provided leadership for youth and children's ministries. During the decade 2000-2010 in Pennsylvania, Dr. Melton developed a Stephen Ministry, which continues to be active. Pastor Melton and his wife, Kathy, have five grown children and three grandsons. They enjoy bike-riding, playing tennis, motorcycling, traveling, and visiting museums.